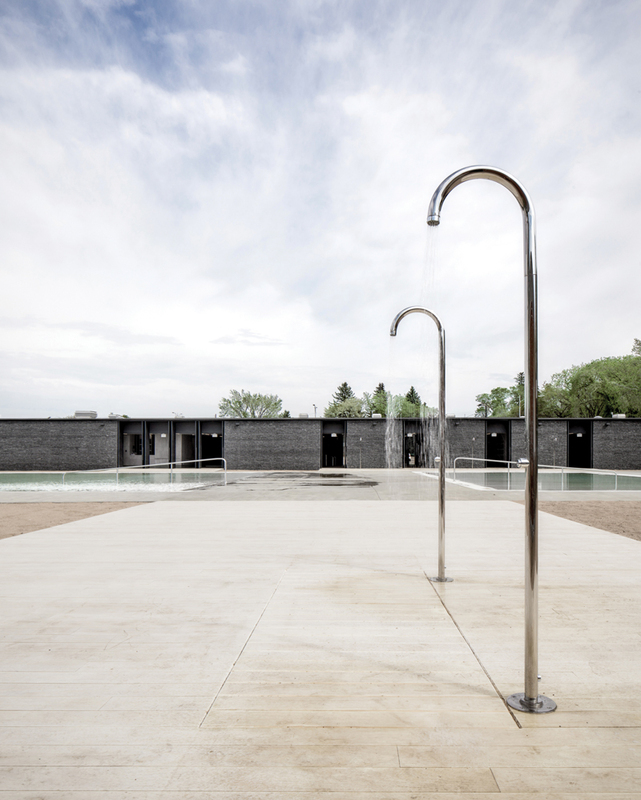 The first view you get of Edmonton?s latest outdoor pool is a long black gabion wall. But it?s no ordinary wall: it has a particularly even texture and refined construction that hints at something special on the other side. And indeed, there is. It?s the country?s first natural swimming pool?a system where plants, rather than chemicals, are used to treat the water. It?s a sweltering hot August afternoon when we visit. Coming by transit from the north, the approach to the pool has no sidewalk, no signage, and no formal pathway, so it?s a bit disorienting to find our way to the entrance. But we hear the clear and familiar sounds of swimmers behind the wall, and eventually join a line of visitors. Admission is a thirty-minute wait?demand is high for this novel place?but the building is oriented to provide ample shade for waiting alongside the east-facing wall. A level ground plane unites the shower deck, pools, and beach areas into a single controlled composition. A swimming hole has long existed in Borden Park. In the late nineteenth century, residents enjoyed dipping into a pond in their dungarees; after the park was formally established in 1906, one of the city?s first three outdoor swimming pools was opened in the same spot.